Since her coronation in 1952, the Queen has seen 12 prime ministers and 12 US presidents. 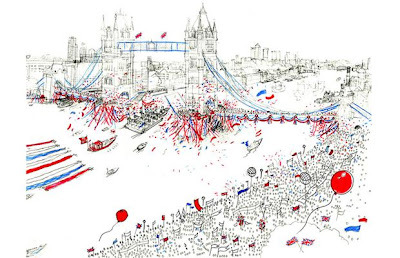 Today Queen Elizabeth II celebrates her Diamond Jubilee. From the snowiest corner of her realm, comes the unveiling of a special Jubilee emblem carved in ice at Ottawa's annual Winterlude festival, amongst a series of celebratory gestures from across the Dominion of Canada. The federal government revealed in December that it had set a $7.5-million budget to celebrate the royal anniversary. Most of which is earmarked for the Jubilee medal presentations, which are to be held in Ottawa and at provincial capitals throughout 2012. More than 60,000 of the country's most dedicated volunteers and outstanding achievers are to be awarded the Jubilee medal. 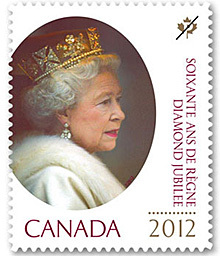 Canada Post will issue a set of commemorative stamps marking each decade of the Queen's reign, including one design that recalls the Diamond Jubilee of Elizabeth's own great-great grandmother, Queen Victoria, in 1897. The big event to mark the Elizabeth's 60 years on the throne will be an 11-kilometre flotilla of 1,000 ships that will sail down the River Thames in one of the biggest, and most spectacular, events ever seen in London and witnessed on the river, since the 17th century. The $15-million pageant will include a royal barge and feature some 20,000 participants, historic boats, working vessels, small kayaks, musicians and an orchestra, as well as a unique floating bell tower. Canadians remain split on continuing to use the monarchy as head of state. On Jan 16th, Forum Research released data showing 43 per cent of respondents were in favour of abolishing the monarchy after Queen Elizabeth II dies, 43 per cent were against it and the remaining 14 per cent had no specific opinion. At last month's big liberal convention in Ottawa, Liberal delegates rejected a motion to abolish the monarchy. After the Queen will come Prince Charles, after Prince Charles will come Prince William. Why are we still wasting money on this outdated, archaic institution?